I've always thought I have deep set eyes but after this fantastic article I'm starting to think protruding eyes since the shadow is from the bottom lid, and my top lid area is just fantastical lol. Please help! Also are they small? Oh thank you for calling the page fantastic! Your eyes do lean towards being protruding, and big. You see this because your top lid doesn't have that deep dip that comes with being deep in the eye socket. The sort of bulges out of the socket. So when applying makeup you have a whole lot of looks to choose from because protruding eyes are not very restrictive, unless you're trying to play them down. The most important aspect of your eye shadow is that you must blend it well. This is because protruding eyelids leave so much space to be seen, unlike deep set eyes. So it's nice when the shadow just fades into the skin, with no visible edges to the color. And about your fantastical false lashes:), I think you probably love them as they are, but if you trim them, you could rather go more bold and creative with the eye shadow. Trim them to be shorter on the insides, then longer as you move towards the outer edge of your eye. I think a great look on you would be something with an emphasis on eyeliner, with the liner being thicker on the top lash line. Then some highlight only on the inner corner of your eyes. Comments for Protruding or Deep Set-Help! To push the bottom eye socket in a little, you can use a little bit of concealer and highlighter on it to make it appear lighter and have it reflect light. This is going to make the dip at the top of the cheekbone come out a little. Then tight line, and line the bottom lash line with dark eyeliner, making it as thick as you'd like. You can also line with a dark eyeshadow. This will make the top part recede. It won't ever completely go away but hopefully this trick of light will make it a littlle less visible! YYayyyy thank you thank you thank you! And yeah i wasn't too fond of the lashes but it was the only eye close up pic I had. 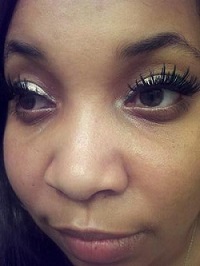 I love the look where the lashes get longer as you go outward so definitely trying that! And the eyeliner! Maybe think about a wing tip? *shrug* I'm just so happy I know now! My conern is the bottom eye socket bulging part. How would I hide that? I don't like it.